Let us look first at some interesting data on women and stress. Figures from the Health and Safety Executive show that British women between the ages of 35 and 44 are 67 percent more likely to experience work-related stress than their male colleagues. Furthermore, a study by the University of Cambridge reports that North American and Western European women suffer nearly twice as often from anxiety as men. So, what gives–and what can you do about it? Why are Women More Stressed Than Men? As more women entered the workforce full-time, abandoning traditional roles as stay-at-home wives and mothers, the spotlight was cast on the idea that business women seem to be more stressed than their male counterparts. In recent years, several studies have been done to explore this phenomenon. Not surprisingly, hormones appear to play a crucial role. When women and men face stressful situations, their brains release two stress hormones: cortisol and epinephrine. These hormones are the impetus behind what is known as the “flight or fight” response. There’s a key difference in the way in which men and women’s brains react to stress, however: Women’s brains release a lot more of another hormone, oxytocin, than men’s brains. Oxytocin is known as the nurturing and attachment hormone. It is associated with calming and relaxing emotions. As a result, women have an innate tendency to want to “tend and befriend” when under stress. They often worry more about others’ well-being than their own, and they turn to co-workers, friends and other intimates for guidance. Because cortisol and epinephrine are the dominant hormones among men facing stress, guys are much likelier to simply run away. First, they tend to make a strong effort to solve the problem at hand. If it fails, however, they seek diversions and tend to be good at dropping the matter from their minds. Let’s put the preceding information into context from a business standpoint. Due to the way that their hormones respond to stress, professional women are much more likely to dwell on and ruminate over stressors in their lives. Their male colleagues, on the other hand, are much better at essentially saying “who cares?” and walking away. For this reason, stressful situations tend to drag on far longer for women–and they affect them for far longer too. According to the American Psychological Association, women are more likely than men to report physical and emotional symptoms of stress. That’s particular true about symptoms like headaches, which are reported by 41 percent of women versus 30 percent of men; indigestion and stomach upsets, which are reported by 32 percent of women versus 21 percent of men; feeling like crying, which is reported by 44 percent of women versus 15 percent of men; and feeling depressed or sad, which is reported by 38 percent of women versus 30 percent of men. What’s worse is that according to a study that was published in the Annals of Behavioral Medicine, dwelling on stressors, as women are susceptible to doing, can double the risk of chronic health problems. If the above information sounds all too familiar to you, you’re probably feeling pretty discouraged by now. Luckily, there’s a lot that you can do to reduce the effects of stress on your life. 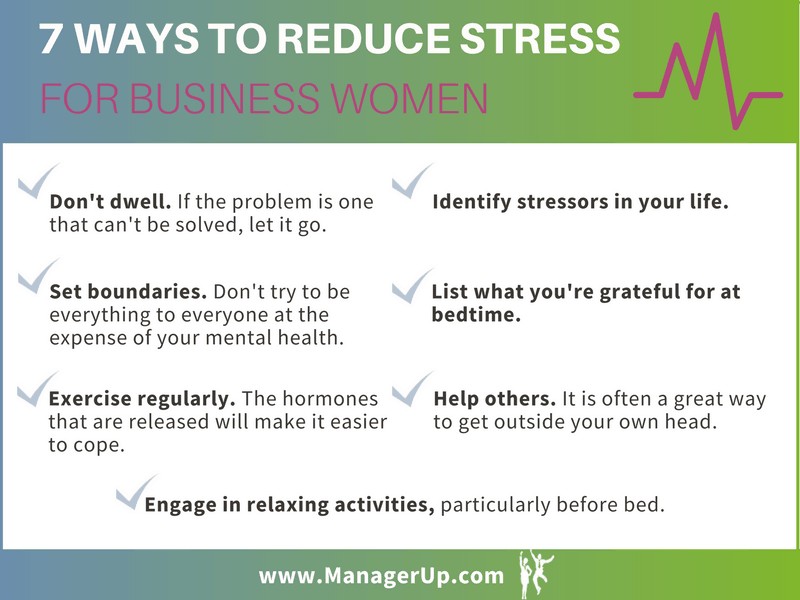 By implementing the following tips, you may be able to reduce the impact that stress has on not just your personal life but on your professional career as well. This is a tough one because women are basically wired to fret over things. When something goes wrong at work, though, focus on solving the issue–if it is solvable. Don’t focus on how you feel. If the problem is one that can’t be solved, let it go. When you’re feeling especially stressed, sit down and figure out what’s causing it. For professional women, one common cause is a seemingly insurmountable workload. Learn how to delegate responsibilities better to give yourself more of a break. Women often have a hard time saying no when someone asks them for help; this goes back to oxytocin, and it’s especially problematic at work. Practice saying no to people. Don’t try to be everything to everyone at the expense of your mental health. It’s easy to get so caught up in day-to-day stressors that you lose sight of all of the good things in your life. A study that was published in Applied Psychology showed that people who list what they’re grateful for at bedtime tend to be less worried and anxious the following day. Adopt this habit to see if it helps. This one is especially important for business women, who are often stuck at their desks all day. Set a goal of getting at least 30 minutes of exercise each day. The hormones that are released, including endorphins, will make it easier to cope. All executives can make time in their busy schedule to get some form of activity each day. TRY THESE 10 EASY EXERCISES TO DO AT HOME! While you should set boundaries when it’s appropriate, helping others is often a great way to get outside your own head. Look for small things that you can do to help others to see if the stress is reduced a little. Particularly before bed, do something relaxing. Massages are especially good because firm pressure on the skin triggers responses from the parasympathetic nervous system, causing the adrenal glands to cut back their release of stress hormones and the brain to boost production of serotonin, the feel-good neurotransmitter. Do you agree with this post? What other strategies would you add to this list? Please share your ideas with us in the comments!